When making diet and lifestyle changes to improve your health and looks, it’s important to be accurate in your formula otherwise you may not end up with the results you desire after having put in a lot of effort. Many people start to make positive changes such as including more fruits and vegetables and drinking more water and including more exercise. These are important beginning baby steps. However, we cannot delude ourselves into thinking these are enough. Why? 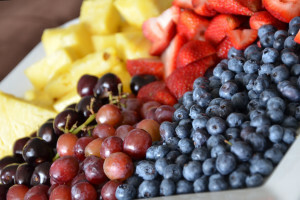 While fruits and vegetables have many anti-oxidants, are high in fiber and water, they are not a magical “pill” that “cancels” out eating toxic and harmful foods like candy bars and sodas. There are certain foods which are HARMFUL to your body and that cause INJURY even if consumed in small amounts. No amount of eating “good” foods will alter that damage. THEY MUST BE OMITTED COMPLETELY in order to achieve optimum health and beauty. Now, I realize that most of you will read that and internally rebel. We don’t like the idea of giving up something that we enjoy and brings us pleasure and comfort. 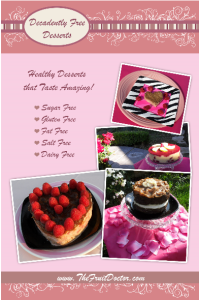 That’s why I wrote my recipe e-book “Decadently Free Desserts”. When I realized I had to omit certain foods I loved but didn’t love me back, I had to find substitutions that I loved and looked forward to eating and that tasted delicious. And, I wanted to eat that way all the time. I didn’t want to “white knuckle” it through. Now, I love the way I eat and I love the way I look and feel. It’s really that easy. We must treat our bodies well all the time and they will treat us well all the time. What is on the “omit” list because it actually harms and injures us? All of these foods cause inflammation and acids to be generated in the body. Raw fruits and vegetables are alkalinizing and soothing to the body. They don’t harm it but are gentle on it. When you find your favorite recipes, you can make them your new staples and build your diet around them. I often times eat the same foods over and over again each day. It works for me and I don’t get tired of it. When I do, I change it up. Change your mentality to realize that you must get rid of those foods and they don’t belong in your body and then change your mentality to actually LOVE your new foods. It should come naturally. Who doesn’t love mango pudding? Cooked grains and legumes like rice and lentils are neutral foods for variety. They aren’t as nourishing as fresh fruits and vegetables, but without salt and oil, they aren’t as harmful either and can make good “cheat” foods when you want variety or something warm. Make a fresh home-made marinara sauce with fresh herbs and no salt or oils and you are good to go. What if you have a lot to omit? Start with one thing and omit and substitute that one thing for 90 days. If you need to commit for another 90 days then do that. When you are ready, choose another thing to omit and find a substitute for and then change that. Keep going in that same direction until you are where you want to be. But definitely keep going in the right direction until you reach your goals.